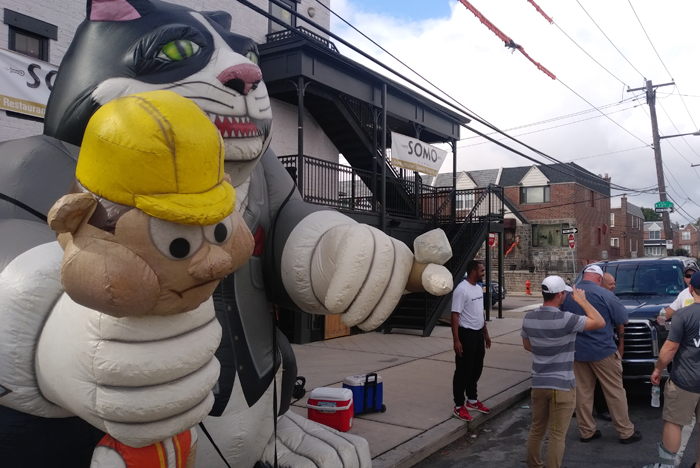 The International Brotherhood of Electrical Workers Local Union 98 has set up an inflatable rat and a handbilling operation outside the new Somo Sophi Restaurant at 3103 South 13th Street in South Philadelphia, which is set to open in a matter of days. Local 98 is protesting the restaurant and its owner, professional football star and Philadelphia native Jahri Evans, for violating local area construction wage and benefits standards. "Jahri Evans should hang his head in shame," said Local 98 Communications Director Frank Keel. "Here's a man who was all too happy to reap the benefits of union representation through the National Football League Players Association for years and make tens of millions of dollars playing professional football, but now is willfully turning his back on the union movement that protected him for more than a decade. We have repeatedly asked Evans for the opportunity to meet in order to explain the benefits of using a union construction workforce, but were turned away every time. We're handbilling nearby residents to alert them to the situation and we're every bit as dug in as Evans was as an All-Pro offensive lineman. We're not going anywhere." In the year 2009, following the final year of his rookie contract with New Orleans, Evans was re-signed to a seven-year, $56.7 million contract with the team, which made him one of the highest paid offensive lineman in professional football history. After his tenure ended, he signed with Green Bay last season and is currently a free agent. He is back home now in Philadelphia and has entered the development business. "Jahri Evans is a multi-millionaire and has a strong union to thank for his financial success as a professional football player," Keel concluded. "He still has time to resume his football career, should he choose to do so, and he also has time to make things right with his development projects by honoring established area wages and standards. He knows how to reach us. We're right outside his restaurant's window." The above content was created by IBEW Local 98 and published by PhillyVoice.com’s Sales and Marketing department. The content does not reflect the views and opinions of PhillyVoice.com’s editorial staff.